As appeared in Today’s Motor Vehicle. KOENIG EXPANDER® plugs feature a serrated outer shell that expands when force is applied to the integrated ball or mandrel, creating a leak-proof seal with evenly distributed pressure. Make it lighter. Make it smaller. Make it more efficient. And make it reliable. Oh, and did we mention, don’t sacrifice performance? Today, automotive engineers and project managers must produce powertrains that deliver optimum fuel efficiency and long-term reliability without sacrificing performance. Meanwhile, global initiatives to reduce emissions and improve energy conservation have expanded the role of hybrid powertrains. Working with hybrids presents additional challenges, as engineers must combine gas and electric systems inside the limited space afforded by modern, aerodynamically designed frames and bodywork. In response, auto designers have initiated comprehensive lightweighting programs combined with compact powertrain designs. Engine and transmission housings are smaller and made with lightweight metal alloys. The geometries of ports and passages that carry critical fluids within powertrain housings are more complex, and ports are closer together, with thinner walls. Greg Kozlowski, application engineer at metal-to-metal sealing and flow control products producer SFC KOENIG has worked with major automotive manufacturers to provide critical sealing solutions for drilled ports in a wide variety of compact, lightweight alloy powertrain applications. 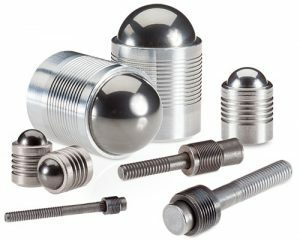 In the past, Kozlowski explains, products such as cup plugs, ball plugs, and threaded fasteners (screw plugs) were the most common methods of sealing ports. Those low-cost solutions, however, are not suitable for thin-wall applications. The high-stress installation forces needed to seat a cup, ball, or screw can deform and crack the surrounding material. Also, screws require tapping the port and may need sealant application, adding production steps that can lead to contamination from debris or sealant entering the fluid system. Many low-cost plugs have less-precise production tolerances, resulting in part-to-part size variation. In a high-volume production environment, where port diameters are drilled to exact tolerances across multiple assemblies, size variation in the sealing plugs can prove costly. A plug that is too small will leak, and one that is too large may damage the base as it is installed. 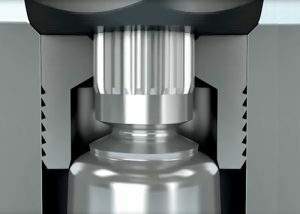 “Customers who relied on cup, ball, or threaded fasteners have realized these products are no longer appropriate,” Kozlowski says, adding that more-advanced sealing methods, such as KOENIG EXPANDER expansion-style plugs, are taking the lead in providing low-stress sealing solutions in compact, lightweight engines and transmissions. Expansion plugs employ an expandable, serrated outer shell that is activated by a pre-assembled, metal ball or mandrel. The plug is positioned in the port and then set into place by pushing the ball or pulling the mandrel into the shell with a hand-held or automated tool. The shell expands radially, causing its serrated edges to press against the port wall, creating a leak-proof metal-to-metal seal with evenly distributed pressures. Installing plugs without detriment to surrounding materials is critical when working with today’s lightweight metal alloys and thin-wall ports. Kozlowski points out that expansion-style plugs are manufactured to precise tolerances, allowing for tightly controlled stresses on surrounding materials, while providing a proven leak-proof seal. 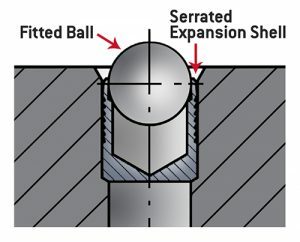 Engineers can further adjust the pressures applied to port walls by slightly increasing the diameter of the port bore, relative to the expander plug. If the resultant port bore diameter is not larger than a specified limit of the shell’s expansion range, a secure seal is typically possible. “We take a collaborative three-level approach in working with customers to arrive at a reliable and cost-effective sealing solution for low-stress applications,” Kozlowski says. Level 1: Apply off-the-shelf products from standard inventory for the lowest-cost solution. If installation stress levels are too high, the engineering team may recommend design adjustments to the base component, such as increasing port bore diameters to allow the standard solution to work. Level 2: A custom solution based on a minor design derivative of the standard sealing product to meet application requirements. Level 3: SFC KOENIG engineers can develop a completely custom part using expander technology. Even with advanced sealing technologies, engineers must be vigilant when specifications call for installation of a plug in thin-wall ports, especially when ports are located near other fluid pathways or moving parts. 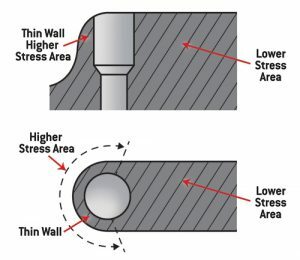 A slight deformity in a port wall can protrude into a neighboring section, causing misalignment of moving components, premature wear from friction, and restrictions in fluid transmission, Kozlowski says. KOENIG EXPANDER® plugs are available in a wide range of sizes and metals to meet specific, low-stress, metal-to-metal sealing application needs. The company’s engineers recently developed a custom solution, working with a major automaker, to seal ports in an aluminum alloy transmission housing that contained a bearing shaft. Due to the position of installation and the stress requirements, engineers designed a custom expander utilizing a low stress pin design instead of a ball. This custom expander solution created a reliable seal with very low stresses on port walls – sealing ports in the housing and preventing sidewalls from deforming and interfering with the bearing shaft. Testing is essential when developing such sealing solutions. Application engineers often conduct destructive tests on base alloys to identify the physical limits of the sealing product and the base materials. Destructive tests that take materials to their limits help engineers understand and optimize long-term reliability of sealing solutions. This is important because a leaking seal, especially across an entire product line, can lead to increased warranty costs for automakers. Engineers also must consider production costs in their specification process. Scrapping components damaged during seal installation adds time and material costs, so low-stress expansion seal technologies can reduce waste by lowering scrap rates. Pull type expander plugs use an integrated mandrel to expand the outer shell and are ideal for sealing deep or angled ports. One-piece plugs arrive ready for installation with a flexible tolerance range up to 0.12mm for pull-style expander plugs and up to 0.10mm for push-style plugs. While advanced sealing technologies typically cost more per part than the traditional cup, ball, and screw methods, costs are offset by the reduction in waste and production time. Advances in sealing technology and the ongoing development and re-engineering of the smallest system components contribute to success in modern vehicle lightweighting and space-saving programs. As engineers continue to collaborate to find the best methods of designing and manufacturing assemblies with lightweight alloys and compact designs, automakers can expect to achieve the goals of reduced emissions, energy conservation, and optimum vehicle performance. Learn more about KOENIG EXPANDER plugs and our engineering support.